Kangana Ranaut has been making headlines ever since her explosive interview on Rajat Sharma’s Aap Ki Adalat. Kangana, who is known to be outspoken, did not hold back during her interview and shocked everyone with her revelations about her alleged relationship with Hrithik Roshan, Aditya Pancholi among others. After a while, Aditya Pancholi’s wife Zarina Wahab spoke to a portal calling all of Kangana Ranaut’s allegations untrue. She has said that if she knew that Kangana was dating her husband then why would she even think of her like her daughter. Zarina also added that if her husband Aditya Pancholi was such a bad person then why was Kangana Ranaut with him for four-and-a-half years. 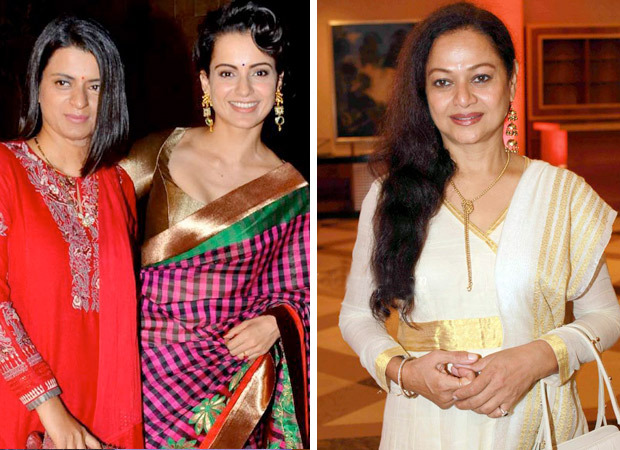 While Kangana Ranaut is yet to respond to Zarina Wahab’s allegations, the actress’ elder sister Rangoli Chandel has taken up the charge and slammed the veteran actress for taking a dig at her sister. In a series of tweets, Rangoli revealed some information about them meeting, pleading several times for help and Zarina Wahab taking Kangana to meet Sanjay Leela Bhansali. Sana Pancholi is born in 1985 Kangana Ranaut is brn in 1987 do u hv shame u r a prt of dis exploitation of a grl youngr dan ur own daughter? U bth sud b behnd d bars, I wan 2 knw if U knw ur husbnd s exploitin dis minr, y wl u giv hr gifts n lure hr by takin hr 2 bg directrs home? Y wud u gift Kangana diamonds and clothes frm Bangkok n request her nt to go to cops if you knew ur husband is dating her as claimed by you? You didn’t only take her to Sanjay Leela Bhansali’s house but you also took her to meet your sisters in Bandra…. …..and you sent regular fish biryani to her house and pleaded her not to go to cops. Why Zarina ji pls answer ??? For now, it seems like Kangana Ranaut’s elder sister Rangoli Chandel seems in no mood to forgive and forget any allegations made on her sister. Meanwhile, Kangana Ranaut is gearing up for the release of Hansal Mehta’s Simran which is to release on September 15, 2017.